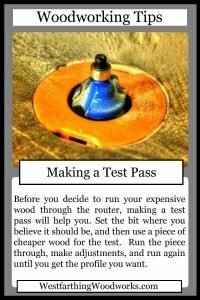 This woodworking tips card is about making a test pass with the router or router table to make sure everything is set up correctly. When working with the router, you can do a little work on the front end to make sure your results are what you want them to be. Here is how. Before you go and ruin your best wood, it is important to do a test pass with a piece of scrap. This helps you know that your setup is accurate. Many times, the router table can be a little tough to get set up correctly. If you take your time, and keep making test passes with scraps, you can be sure that the bit will be in the right position. It’s important to make sure that the scrap you are testing is the same thickness as the wood you will be using. In the case of a pattern bit, the look will be different on a piece that is thicker or thinner. Find something in the shop (preferably something cheap) and use it to check the position of the router bit. After you have made your test passes, and your adjustments, run one more piece through and see what it looks like. If you are satisfied with what you see, you can now run the real project wood through the router. Sometimes I use my router table to make dadoes or rabbets. In a case like this, I make several test passes and measure the resulting cut. It’s helpful to work on one dimension at a time. I use this method for Adding Binding Inlay to some of my projects. For example, a rabbet has a height and a depth dimension. Work on the depth until it is spot on, and then move over to the height. One of these is controlled by the fence, and the other by the height of the router bit. So, once you have a single dimension in place, it will not change as you adjust the other. Working like this, you can get your router to make very accurate rabbets and dadoes in a very short amount if time. It’s helpful when you don’t have a dado set for the table saw. 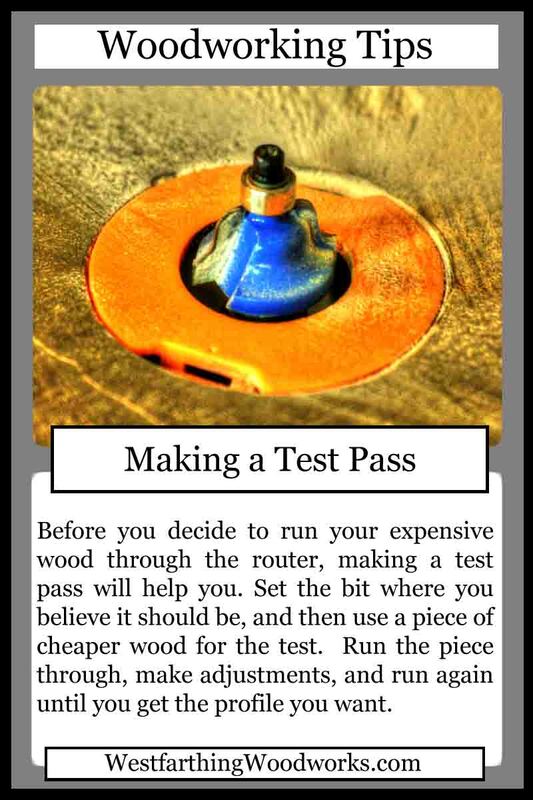 If you have any questions on Woodworking Tips Cards – Making a Test Pass, please leave a comment and I will be glad to answer them. Also, please Subscribe so you don’t miss out on anything. Happy building.